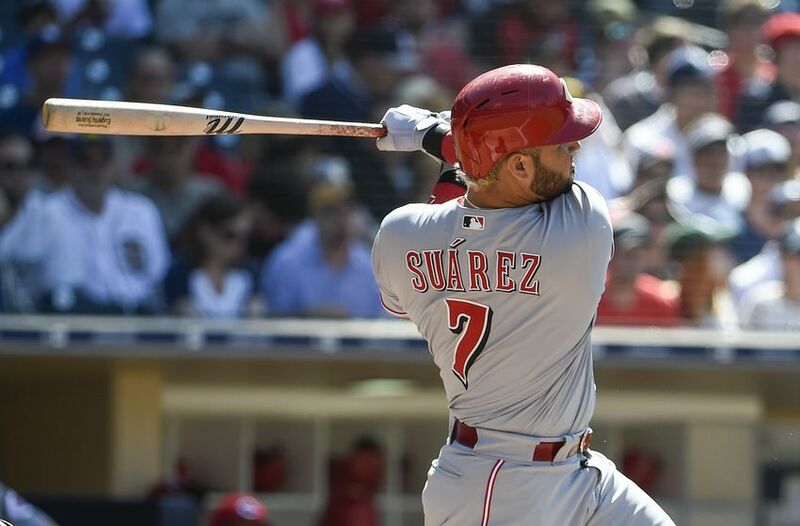 It appears the San Diego Padres have contacted the Cincinnati Reds about third baseman Eugenio Suarez. Coming off his best year in Major League Baseball, his price tag would not be cheap. 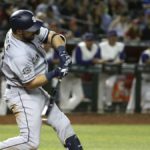 Should the Padres pay the cost? As the GM Meetings rolled, the Padres had numerous options on the table concerning potential trades for key positions on the diamond. One such player the Padres desire to man third base is Cincinnati Reds third baseman Eugenio Suarez, who is fresh off his first All-Star appearance as well as a contract extension worth $66 million over seven years. Suarez had a season to remember in 2018, posting a .284/.366/.526 batting line with 34 home runs and a 135 wRC+. The bump in power did come at the expense of a drop in his walk rate, with a BB% dropping from 13.3% in 2017 to a 10.6% in 2018, however, his ISO rating spiked from .200 in 2017 to .243 in 2018, justifying the power. While the power numbers are undoubtedly exciting, fans need to take those numbers with a grain of salt. Suarez plays half of his games in Great American Ball Park, which is jokingly referred to as Great American Small Park for a reason, as a fly ball that would be an out in Petco Park is as good as gone in Cincinnati. His numbers on the road also suggest that he prefers the wide open spaces of Cincinnati due to his ISO and HR/FB rates being much higher at home than they are on the road. His high average rate can also be attributed to a high BABIP of .322, a high number that indicates that Lady Luck may have favored Suarez. Said BABIP is close to his career average of .298 and the power should play wherever he goes, as he owned a hard contact rate of 48.6% compared to a minuscule 8.4% soft contact rate. 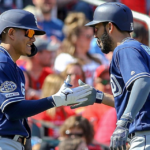 The Padres are indeed in need of a third baseman as Myers struggled in the transition last year while Christian Villanueva is not seen as the everyday third baseman in the long term. Prospect Hudson Potts is not projected to don a San Diego jersey until 2021 while top-prospect Fernando Tatis Jr., while he can man third base, will undoubtedly be brought up as a shortstop. 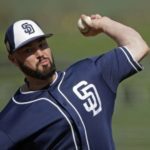 So, what will it take to make Suarez a San Diego Padre? Short answer? A lot. 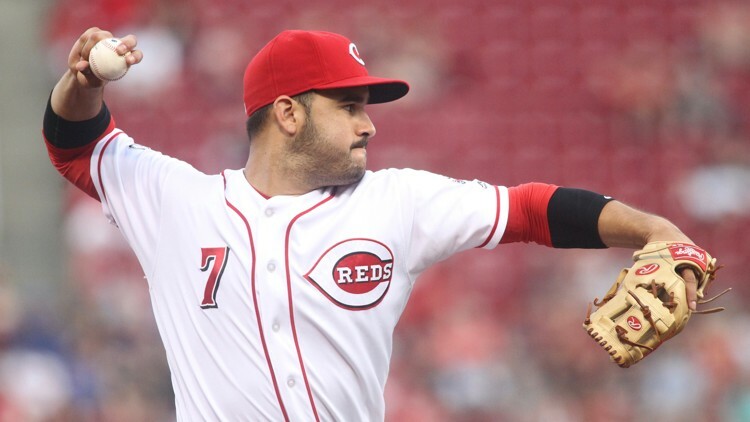 The Reds are currently transitioning into rebuilding mode, and while that is usually terms for “trade anything that has a scrap of value”, Suarez is too precious of a nugget for Cincinnati to trade. 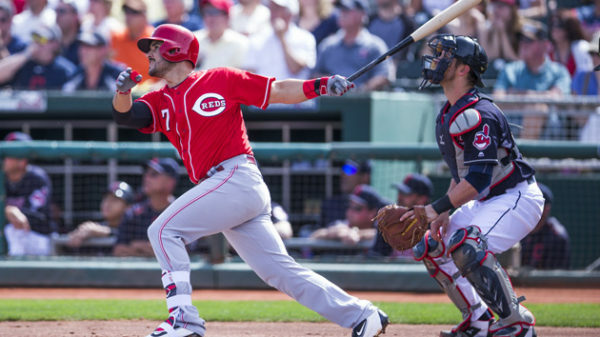 The 27-year-old is seen as a building block to the next great Reds team, and it will take a bounty of prospects and players to convince General Manager Nick Krall to pull the trigger on the deal. A.J. 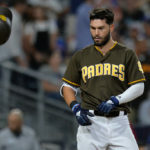 Preller has hinted that Myers’ athleticism may work best in the outfield, and it is no secret that outfielders Franmil Reyes and Hunter Renfroe are on the trading block. The Reds have also been hinting at a potential trade of center fielder Billy Hamilton and adding an outfielder. While neither Renfroe or Reyes can man the position, it could give the Reds flexibility to move one of their in-house options to center field or make an extra trade. A swap of venues also would bring out the best in Renfroe and/or Reyes’ power numbers and provide a boost to their careers as hitters. Starting pitching is another Cincinnati priority and, while the Padres don’t have much Major League talent at the moment, they have boatloads of pitching prospects in the minors. But to land Suarez, San Diego will have to part ways with one of their top pitchers. This could mean a near-Majors talent like Cal Quantrill or Logan Allen would be included, as well as lower-level players like Luis Patino or Adrian Morejon. 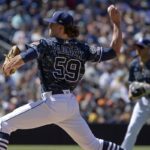 In a scrapped deal for then-Ray Chris Archer, San Diego would have dealt Chris Paddack (the staff’s choice for MILBY Pitcher of the Year), Patino, Renfroe, and Austin Hedges for Archer, a price that Preller balked at as he wasn’t willing to deal Patino or Paddack. He may have to if he wants Suarez. He is very pricey and comes with some doubts, but Ron Fowler has proven that he is willing to break out the checkbook to bring players to San Diego if it means winning ballgames. 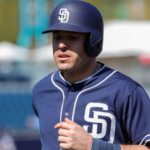 If San Diego does pull the trigger and send a substantial package for the Venezuelan third-baseman, Suarez would provide immediate thump in Andy Green‘s lineup while bringing stability to a position the Padres need. Suarez’ home and away split for 2018 is .900 OPS at home and .884 OPS on the road, hardly the dramatic difference you make it out to be. As for the cost, we are talking about a 27 year old all star of proven ability, signed to a long term contract, he isn’t going to come cheap. A rebuilding club will not be interested in Myers, so please let’s stop with that nonsense. No club wants him. They also will not be interested in Villanueva, Renfroe, Reyes or Jankowski. These players are marginal at best. They will want real prospects. Think 2 of SD’s top 20 prospects as a point of departure. Then you can add Perdomo or Quantrill, players like that. It’s definitely a good idea to look into adding players like Suarez, but let’s not kid ourselves, it’s gonna cost. No way the Reds make that deal. I don’t think Potts is going to make it as a big league hitter. In fact they could include him in the deal to lessen some of the other talent necessary. What do you mean you don’t think Potts will make it as a big league hitter he hasn’t even advanced through the system thouroughly yet. Just because he has a K rate does not mean he wont make he is barely 19 almost 20. Look what happened to Rizzo, dont ever underestimate a player who has yet to reach his potential, Butch. Many evaluators say he had the makings to be a middle of the order threat do a bit more research before making comments such as the one above. I think adding Suarez and someone like Eovaldi or Sonny Gray would be huge. Suarez is exactly what we need at 3B. The haul for him should be around one of Renfroe/Franmil, Cal ( since he’s high in Cin list ) and someone like Janikowski to man their CF? If another lower SP prospect is needed, that’s fine. I’d even throw in Nix if that’s what it took? But not Margot or Luchissi. Very true his numbers are better on the road, but in NL west the road is Coors field and Arizona. Plus Petco is more favorable to hitters now then it was with Nevin and Klesko. I understand the reason why not to trade for his as well as Patiño and Paddack look to be special. The Padres need to jump at this opportunity. I know that it’s going to take a substantial haul in order to get Suarez, but he is a sure thing. Everything about Suarez fits what the Padres need: controllable for seven years on a team friendly contract, boost to the offense, and a good influence on fellow infielders Tatis jr. and Urias. 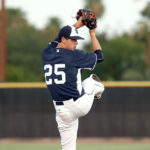 The Reds are looking for a major league ready left handed starter, center fielder, and covet Quantrill for some reason. I think a package of Margot, Lucchesi, Quantrill, and Baez will get it done. If the Padres goal is to win a World Series Suarez is a big step towards that accomplishment. I would take Lucchesi out of that deal and put another name in there.